Brown beef and saute onion. Drain well. Add everything else except the macaroni and stir. Bring to a boil. Add macaroni, reduce heat to just above a simmer, and cook until the macaroni is done, stirring often. I usually let it cook for about 10 minutes. Serve w/ cheese if desired, and cornbread. Cornbread-this one is unusual too. I think it's pretty moist (in my experience-I'm no cornbread expert though) and since it's made with whole wheat flour it's really dense and sort of heavy. Hard to describe. Anyway it's got whole grains so it must be good for you right? Heat oven to 350°. Grease a 9x9 or 8x8 square baking pan. Mix flour, corn meal, cream of tartar, baking soda and salt in a small bowl. Cut in butter until mixture looks like coarse corn meal. Add egg and milk and stir just until mixed. Pour into prepared pan. Bake for 25 minutes or until a toothpick inserted in the center comes out clean. Sparky is our very sweet, very spoiled cat. 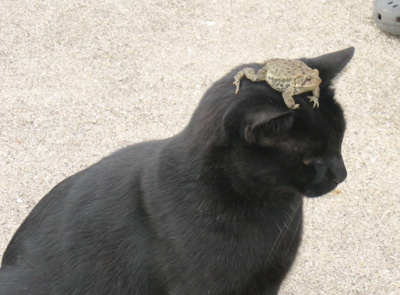 Here's a picture of him from last summer-as you can see he's very mellow and tolerant. Anyway, Sparky has plenty of places to go when it rains-we have several buildings here. But he prefers to stay up at the house, waiting for the kids to come outside (and feed him). 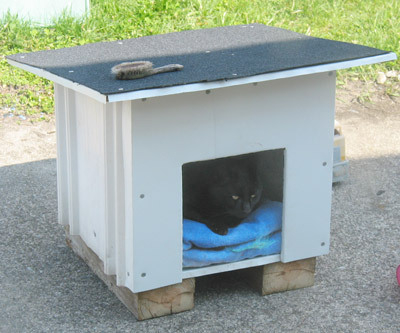 Even if it's raining, windy, snowy, freezing, etc he sits out there right in it so we decided to build him a little cat house. Steve did all the work on it, mostly with stuff found around here from older projects. The kids are going to paint it this summer when the weather is nicer so for now, it's all white. Here's a picture of Sparky taking a nap in it-he seems to like it so far. It's only been out there a few days. I've decided to make quilt curtains for my sewing/scrapping room. Not exactly quilted but made from quilt blocks. I'll back it with a sheet and no batting in between. Anyway I picked out my block and had read in several places that you should always do a test block before cutting all of the pieces out. I figured that might be a good idea since I've never done anything more complicated than a nine patch (other than those Debbie Mumm blocks and those don't count since I only did one of each). I decided to do the test block out of different fabric. Good thing I did do the test block because I messed up on part of it and had to rip out a few seams. Anyway this is my first test block. The second one went together more easily but the colors were hideous so I didn't take a picture of it. The curtains won't be this color-in place of the red they'll be a very light pink and in place of the blue they'll be a very light green. The white will be all white (there is a white-on-white pattern on it but it's very subtle). I found the block in a Better Homes and Gardens 100 Quilt Blocks magazine that's out right now and I planned the colors and stuff in Electric Quilt 5. My friend Terri M has a craft yahoo group. She sent the members some miscellaneous embellishments out with the instructions that we're supposed to make something from it. I got my envelope of embellishments today and in it was a chipboard circle with a Y on it, 2 burgundy silk flowers, some eyelash fiber, some white fiber, and some flowery trim. Quite a challenge since my usual comfort zone is pastels or brights. 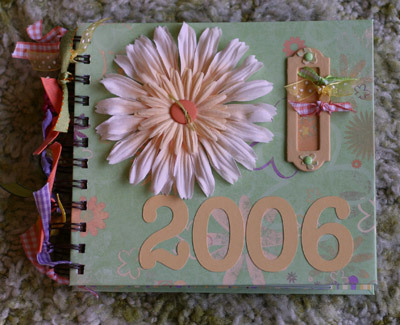 So anyway earlier today my friend Colleen sent me a link to this blog where I found the cutest post it notepad holder. I decided I would case that for my project (case means copy and steal exactly or something like that. I didn't do it exactly the same...but close). So this is what I came up with. The diamond and french script paper is from Scenic Route. The pink is from Pebbles in my Pocket. 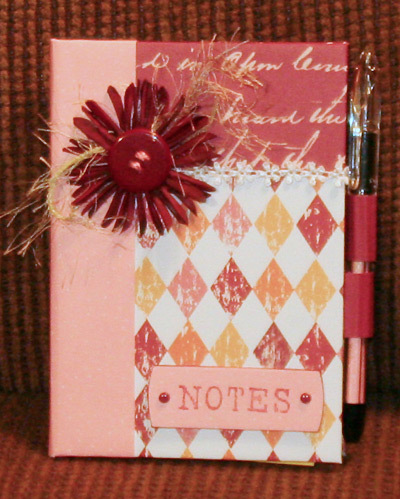 The pen loops are made with Baroque Burgundy cardstock from Stampin Up (it's retired). The same cardstock lines the inside of the covers but I forgot to take a picture of that. The pen is an RSVP pen and I put pink paper in it (RSVP pens are neat-you can put a strip of paper inside the barrel to decorate them). I put a big fat button on the flower with some pink fibers from Bazzill threaded through the holes. The eyelash fiber is behind the flower and the flowery trim is on the front. I love that trim-I'll have to find out where Terri got it. The chipboard circle was cut to sort of a label shape and covered with the pink paper. I inked the edges with baroque burgundy ink. I stamped NOTES on it with baroque burgundy ink using Ma Vinci Harting Small letter stamps, then I punched holes and put some Bazzill brads in them. Inside is a post it pad about 4x6. The original project used a 3x5 post it pad so I had to fix the dimensions a little. I made the spine too narrow (forgot to compensate for the thickness of mat board vs chipboard) so I had to take a few pages off the post it pad. Something to remember for next time I guess. I thought it turned out kinda cute. Thanks Terri, for the fun challenge! On Saturday when we dyed eggs (complete with tattoos), we also made cupcakes. Walmart was all out of the Easter sugar decorations so I bought some icing in a tube and the kids decorated them with that stuff. I used a cake mix for the cupcakes (I was going to make them from scratch but with all the things we did that day (Sammy's dancing, walmart, cupcakes, eggs, etc) I decided to just use a mix). I did make the icing though-here's the recipe. It frosted 24 cupcakes and there was about 1/2 to 3/4 cup leftover. In a bowl, beat the butter, milk and vanilla until smooth. Add sugar about 1/2 cup at a time. Make sure the mixer is on low when you add it or you'll get a cloud of powdered sugar. Experience speaking here. Keep beating until it's all smooth. You may need a bit more or less sugar depending on how you like your icing. I am not picky about it so for me, it's easier to just add the 4 cups and be done with it. Another recipe-this is not Easter related but it is food. I made this on Saturday and it was really good. Heat oven to 375° F. Brown pork chops in olive oil and transfer to a baking dish. It's ok if they overlap. Sprinkle with onion soup mix. Pour the soups over the top and then pour the milk over that. You don't need to mix it-somehow it mixes up in the oven. Cover tightly with foil and bake for about 45 minutes to 1 hour. Serve with something that goes with gravy, like rice, mashed potatoes, or plain noodles because this recipe makes plenty of gravy. Here is the back of my cat quilt. I did the pieced back to save money but I hated it. It does look neat though-like a whole 'nother quilt. Here's how I did it: I took all of the pieces leftover from the fat quarters I used on the quilt and cut them into 4.5" strips of random lengths. I tried to keep the lengths between 6" and 12". I cut all of those up and needed a few more so I picked out a few fat quarters that I didn't think I'd use on anything else and cut those too. 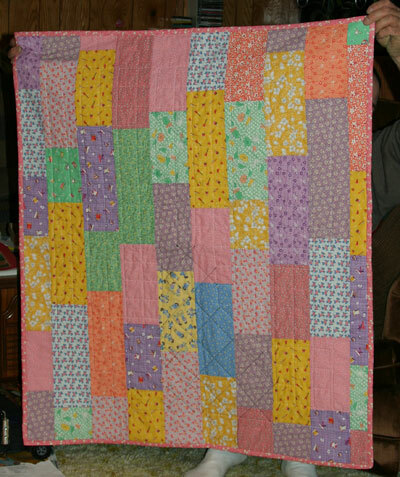 I was aiming to make the back about 2" or more bigger than the quilt all around. I wrote all the sizes on a piece of paper so that I could figure out which lengths to put in each long row so that they would be fairly even. I sewed each row together and pressed the seams open to reduce the bulk. Then I laid out all the rows on the floor and rearranged them (multiple times) so that I wouldn't have the same fabrics next to each other (I did a little though-on the green) and no seams matching up-I wanted the pieces in a sort of staggered pattern. I sewed the rows together and pressed those seams open. It sounds a lot easier than it really was. 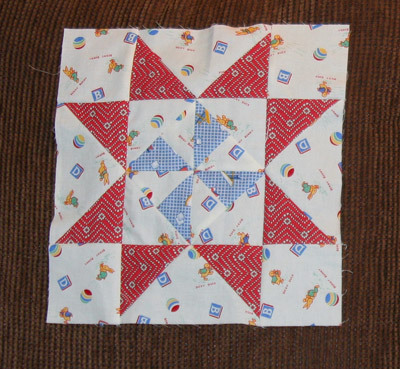 I do like the sewing part of making a quilt but I didn't like sewing this backing together. These really are perfect. They're easy to make and yummy. That's perfection in my book. I found this recipe on recipezaar which is probably my current favorite recipe site. 3. Melt shortening (butter) in a large saucepan over low heat, then stir in cocoa. 6. Stir in remaining ingredients then stir in nuts if using them. the quilting is done in the ditch on most of it, with clear thread. 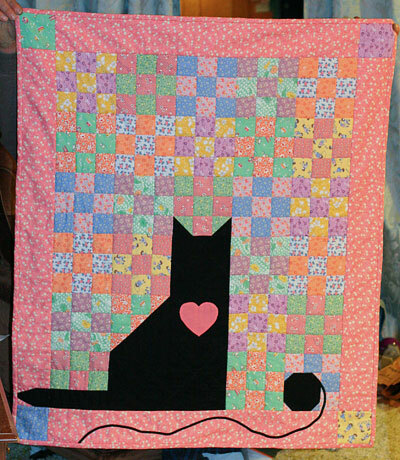 The quilting on the cat is just 3" wide stitching in black thread-you can't really see it I guess. I decided not to quilt in the borders since they're not that wide anyway. The heart was done with freezer paper applique. Not much fun if you ask me-I'll stick with the fusible kind for most projects. I did the continuous method for the binding and I'm not sure if I'll attempt that again. It wasn't so bad except that the seams (I had to piece the fabrics for the binding) fell right at the corners. The fabrics are the 30's reproduction fabrics. I love them-they're so colorful and cheerful. A lady at the quilts your way message board gave me the magazine that had this pattern-I had seen hers posted at the board and asked her where she found the pattern. She told me it was in a magazine and offered to send it to me. People can be so nice. I'm already planning my next quilt project. I haven't really been in the mood to stamp lately but I do need to at least make my 10 christmas cards for March and now April.